Maggie had two swords that she wanted to display prominently in her apartment. Her only criteria was that I make her something beautiful, whether it be a table, cabinet, box, whatever. 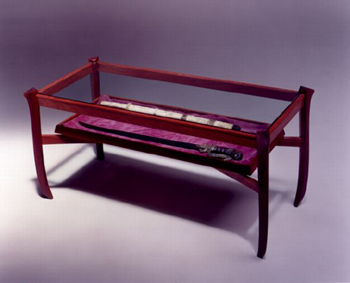 As she headed on a trip to Southeast Asia, I began to build a display table for her swords. The legs mimic the shapes of the two swords and the red narra wood came from sinker logs in the Mekong river. These logs were probably submerged more than fifty years ago, and remained there until an underwater logger freed and floated them to the surface. During Maggie's journey, she actually floated down the Mekong river past the source of the wood while I built her table. The lower shelf that displays the swords is slightly raised above the diagonal cross-stretchers, giving it the appearance of floating.